WEATHER AT START: 54° and sunny. So, it’s Super Bowl Sunday. What are you going to do before game time? Watch 10-hours of pre-game banter discussing which team has a better equipment manager? Heck no. Instead, why not run a half marathon (or a full), have fun, earn some bling and build up a major calorie deficit… so you don’t feel guilty stuffing your face during the Big Game. Well, over 16,000 racers decided to just that and “kicked off” their day by pounding the pavement along Pacific Coast Highway with the annual running of the Surf City Marathon/Half Marathon. Please don’t let me wipeout. Registration costs for Surf City are in keeping with most races, expect to spend in the neighborhood of $90 for the half and a little over $100 for the full (depending on when you sign-up, the earlier the cheaper). Packet pick-up for the race was at the seaside Expo held in the parking lot near the start line. The expo runs Friday and Saturday for bib/shirt pick-up. Parking for the expo was $15 at the beach lots, but if you’re comfortable with a little walking you should be able to find a meter nearby. The expo itself is a nice time, complete with a good amount of vendors present. 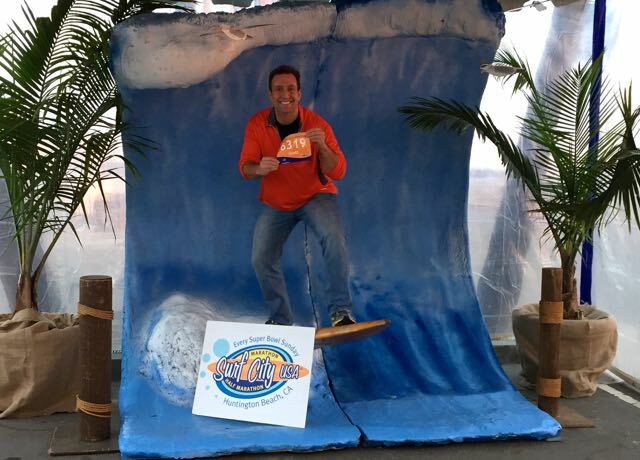 There are also a few photo opportunities (I like the “pose on a surfboard” one myself). And an added bonus is that when you walk out of the expo you’re right on the beach, so hang out for bit and enjoy the view. 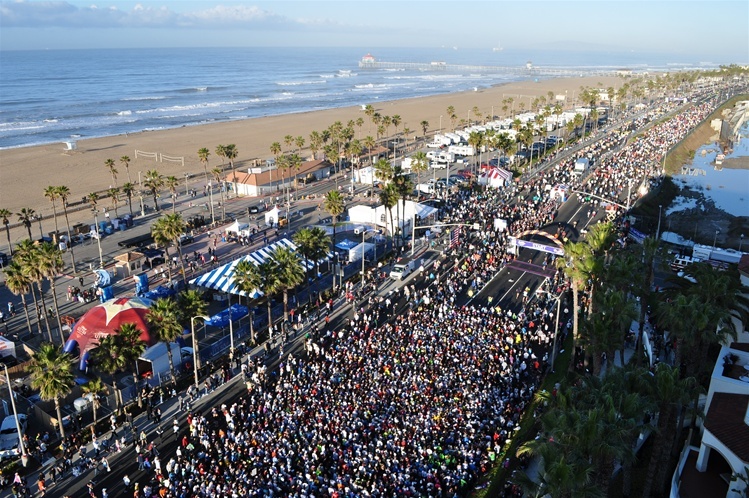 When you’ve got 18,000 runners simultaneously hitting an oceanside community like Huntington Beach, parking can be a little challenging. The race organizers “highly recommend” carpooling and people who arrive on race morning should expect traffic delays, as finding a spot might be a bit tricky. There are shuttle options, which worked for me as I parked at one of the “approved” parking lots (Newland Center or Civic Center) and caught a bus to and from the start line without much hassle at all. Surf City does have a great piece of swag with their finisher’s medal. Continuing their “surfboard” trend that they started in ’08, the race features a “wooden” medal sporting the race’s logo… this year’s model was nicknamed “Riptide.” The full marathon medal is slightly larger than the half marathon version and features a blue ribbon as opposed to red for the half marathon. 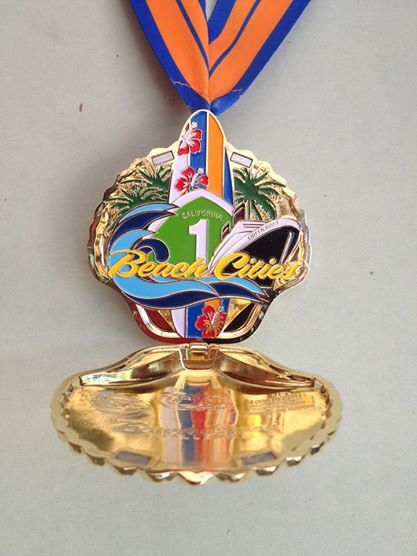 And an extra bonus for you runners who complete the “Beach Cities Challenge” is the latest edition of the challenge medal (this is my second one). By running three consecutive races (Surf City, OC Marathon and Long Beach) you earn this gigantic medal (it’s a heavy sucker). The twist on the latest version is the seashell medal opens and closes (thanks to magnets) like a lady’s compact. 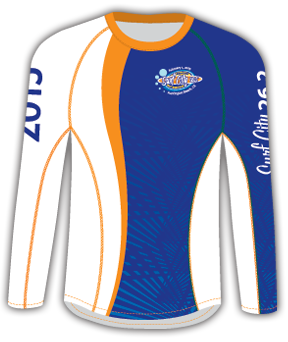 And the “surf theme” shows up again with the race tech shirts, which resembles a surfer’s wetsuit. This year’s long-sleeve shirt featured vertical yet curvy blue, orange and white stripes (the ladies’ version had more muted colors while the unisex was brighter). The race distance was printed along one sleeve while a “2015” ran down the other sleeve. I loved the shirt from the moment I saw it and I look forward to wearing it time and again. Very well done! Oh, and this year the race offered up one additional piece of swag. You received your shirt and bib in a re-usable shopping bag adorned with a “VW Beachcruiser” motif. It’s a very nice touch, especially for us Cali residents who have to bring our own shopping bags (or pay $.10 each at the store). I know of a few other races that give out bags like this and it’s another cool way we can show off our running addictions to everyone. I hope more races follow suit and give out bags like these. CORRECTION: I was told the reusable bag has been given out at the race for several years. I simply didn’t remember it from the last two times I ran Surf City… perhaps that’s because the design was so cool this year that it just stood out in my mind. I certainly hope they keep this practice going. For all its popularity and other positive attributes, the one thing about Surf City that’s very average is the course itself. Now I’ll preface this by saying you are running along PCH near the water, which is really sweet and a great view (and smell the salty air… or maybe that’s just the sweat from the other runners). But that’s pretty much all you run. The course is basically an “out and back,” running along PCH, with one short add on. Around mile 3 you hang a right and spend the next 2-3 miles scampering around a residential neighborhood before returning to PCH a little before mile 6. From there on, it’s nothing but PCH until around mile 8 where you hang a U-turn and head back to the start (you don’t hit the residential section on the way back). One great thing about Surf City though is it’s a speedy and straight course. With just a few hills in the residential section and another hill and slight upgrade a little after mile 10, this course should allow you to push yourself and shoot for a PR. And since it’s a straight course, for the most part, you don’t have to worry about adding distance to the run (I ended up only adding .06 miles over the entire race). Seems like some short miles to me. Surf City does a pretty solid job with their course support, offering plenty of water stops manned by eager volunteers. The “official” drink was Vitalyte, and Cliff shots were offered at more than one stop. I noticed several medical tents set up along the course along with numerous bike volunteers carrying supply packs like beachside St. Bernards. There were also a few bands scattered along the course belting out tunes (thanks for coming out) and I turned down my headphones whenever I ran by them. 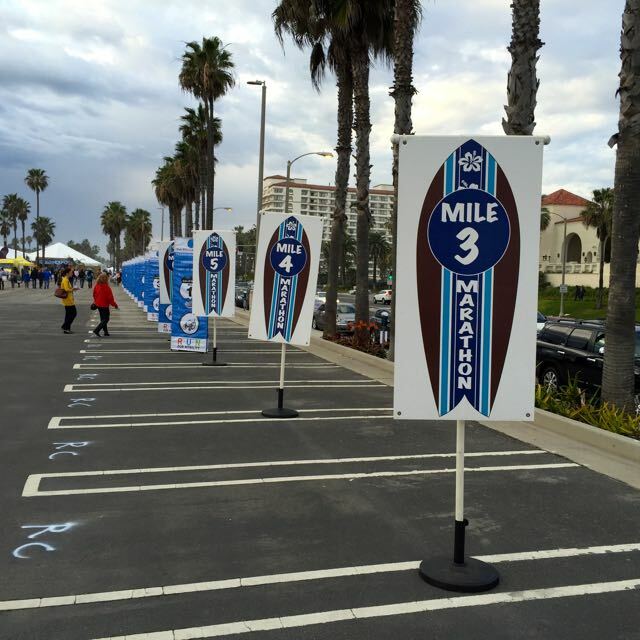 The mile markers on the course featured a “road sign” motif for the half marathoners and a surfboard one for the full marathon. Be sure to bring your GPS as the only digital clock is at the start/finish line. Surf City has decent post race services. Runners get water, a mylar blanket and some snacks (given out in a handy little bag). The over 21 crowd also can go to the beer tent where they can 2 free brews as a fun way to re-hydrate. The expo does remain open on Sunday after the race, although many of the vendors pack-up on Saturday night. But if you’re feeling guilty about not grabbing a race souvenir on Friday or Saturday, you get one last chance to snag a memento (although popular sizes of shirts may be long gone). I have to admit a little personal bias toward Surf City, as it was the site of my first ever half marathon (you never forget your first). But this is just a solid race presented on an enjoyable (if unremarkable) course and offering a slew of runners a chance to run along the beach before heading off to watch the big game. I look forward to running Surf City again next year. 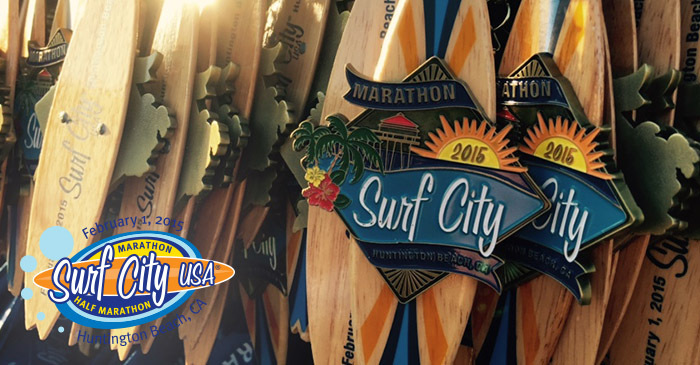 Posted on February 3, 2015, in General, Race Review and tagged Surf City Half Marathon. Bookmark the permalink. 4 Comments. I’m definitely with you on the shirt this time, love it. Here’s my take on the course. One of my favorites, and I think it’s because I ran the marathon last year and the half this year. The marathon got so dang dreary because at mile 15 or so you turn BACK AROUND and do 11 more beach miles (plus, last year, miles 21-26 were into a stiff wind). Given that as my only Surf City experience, this year was pure joy. Just enough beach without overdoing it. Reminds me a lot of the Ventura course, actually, and similar to the Carlsbad Half (though Carlsbad has a lot more rolling hills to deal with). I feel real good about Sunday’s race, as we briefly talked about, the “strategery” came together pretty well. Fastest mile was 8:37 (amazingly, it was mile 12), slowest was 8:57 (mile 4 . . . the first uphill). Finished in 1:55:16, my fourth fastest time. It’s amazing what you can accomplish when you avoid stupidity. Hmmm. I may have to get that on a t-shirt. Weren’t those shirts cool. I really think they hit it on the head with those. I hope they keep up with that theme as it’s kind of unique to them. When you’ve got a closet full of “the same” race shirts it’s nice when someone does something different (that works). I understand your take on the half course when compared to the full. I was cringing when I saw the “U-Turn” sign for the full marathoners. I felt bad for ’em. I always prefer “loop” courses to “out and backs” because I’d rather not pass the same place twice (how’s about something new). And when running an out and back I always seem to just be looking for the turnaround point. I do like that it is a straight course for the most part (you don’t add distance). And congrats on the strategy… excellent that your fastest mile was your last mile (sign of good race management). Here’s looking forward to a fun (and hopefully fast) LA Marathon. I was thinking about course preferences on my drive this morning, actually. Out and backs are my least favorite, although I do like the “now I know we’re almost done” aspect of Surf City . . . make the turn and it’s only four to go. Point to point are great, but usually a logistical nightmare with shuttles or having to have your family drop and drive. Loops are the way to go, convenient start/finish area and no (or minimal) retracing your steps. The San Francisco Marathon and the RnR Arizona Half are two great examples (RnR Arizona full is point-to-point). SF has the out and back across the bridge, but that’s well worth it. Have you done that one? You’d love it . . .
I’ve done all the types and “out and back” courses are my least favorite. Point to points often have really nice courses (like LA and the REVEL series), but you do have the whole “shuttle” aspect to contend with. Fortunately, the majority of P2P races I’ve done have the shuttle system down pretty well (so the hassle isn’t too bad). Everything else being equal I think the “loop” courses are the best of both worlds… the convenience of the out & back and without the added wrinkle of sitting in a bus. I haven’t done either RnR Arizona or SF, but would like to. The problem is scheduling… Arizona used to conflict with the 13.1 series here in town and now might conflict with Star Wars (the one Disney race I’ll probably keep doing). As for SF, it’s in July and has conflicted with Comic Con (my geek passion) in the past. But one of these years I’ll run the Golden Gate (or maybe do it on one of the other SF races).